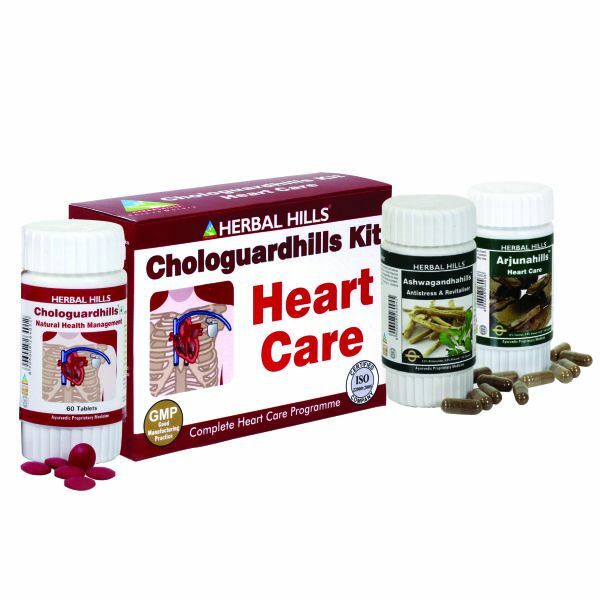 Cardiac Care Kit Contains 1) Chologuardhills 60 tablets 2) Arjunahills 60 capsules 3) Ashwagandhahills - 60 CapsulesMain ingredient Chologuardhills Formulation supported by Single herb Arjunahills + Ashwagandhahills to give Complete, effective & speedy result in helping to cure heart problems1) Chologuardhills 60 tablets : Natural Health Management The selection of herbs in Chologuardhills is based upon a long-standing use as a traditional solution to balance the cholesterol levels. -Arjuna is historically used as a Cardiac tonic. Its astringent activity helps in strengthening the Cardiac muscles & Blood vessels -Guggul a potent anti-lipidemic activity not only reduces cholesterol, but also helps in protection of vessels from the formation of plaque -Triphala with its cleaning & bowel toning property, removes and maintains lipid metabolism Numerous modern scientific studies support the positive effects of the component herbs to improve heart function and vitalityBenefits : - Supports cardiac health - Helps maintain normal range cholesterol levels - Antioxidant properties help in supporting heart from free radical damages caused by stress / strain2) Arjunahills 60 capsules : Heart Care Herbal Arjuna is the best herb that helps in maintaining healthy heart(cardiac control), relieving mental stress & nervousness. - Each capsule contains 250 mg Arjuna Powder and 250 mg of extract (as dry extract) from Arjuna Bark (Terminalia Arjuna) (8:1) (equivalent to 2000 mg of Arjuna Bark. When assayed these capsules contain Tannin NLT 12%, Arjunic acid 0.5%. - In Ayurvedic herbalism for thousands of years, Arjuna has been historically used to improve heart function. Arjuna is considered to deliver optimum support for normal heart muscle function and coronary artery health. Terminalia Arjuna herb demonstrates antioxidant activities. This has been backed up with numerous modern scientific studies demonstrating the positive effect of its component herb to provide to support cardiovascular health and overall health and wellness. Arjuna helps in maintaining healthy cholesterol levelsBenefits : - Heart health support that improves capillary circulation as well as cardiac muscle strength - Antioxidant properties - help support heart and other vital organs from free radical damage - Helps support healthy cholesterol levels3) Ashwagandhahills - 60 CapsulesAshwagandha is a herb that may help reduce anxiety and stress levels, increase vitality, vigor & control fatigue. - Each capsule contains 250 mg Ashwagandha Roots Powder and 100 mg of extract (as dry extract) from Ashwagandha Roots ( Witahnia somnifera) (20:1) (equivalent to 2000 mg of Ashwagandha Roots). When assayed these capsules contain Alkaloids NLT 0.8%, Withanaloids NLT 0.5% - In Ayurvedic literature Ashwagandha has been described for providing Calming, antistress & Rejuvenating effects. This has been backed by modern scientific studies. Ashwagandha has also been used for its adaptogenic properties which helps to improve physical & mental strength and wellbeing. Ashwagandha has also been used for centuries for its Aphrodisiac effectBenefits : - Stress relieving properties - helps in Stress Management - Calm & Rejuvenating - Supports resistance to fatigue.